Home » How-To Library » Which Woods Need More Power? Not all trees are created equal, and neither are chippers. Woods can range widely in density and their fibrous makeup. It's important to consider what you'll be chipping before you get down to business. The types of trees you'll find listed below have some of the most difficult types of wood to chip. Your everyday chippers and chipper shredders won't be able to process them. Instead, these require the power and efficiency of the strongest chippers, such as a commercial-grade PTO or skid steer wood chipper. 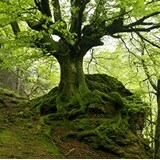 One of the tallest and toughest trees to cut is the beech tree. It's a strong wood that holds up well when used in furniture and flooring. It also can make for some of the best firewood once it's been seasoned properly on a rack. With these trees, you want to use a heavy-duty chipper shredder. Look to professional models for the strength and power to chip through these tough trees. If you don't have a wood-burning furnace, consider selling the chips to someone who does. Freshly cut green bamboo is some of the densest wood you'll find. To cut through fresh bamboo, you need a heavy-duty commercial chipper with knife blades approximately four to six inches long and rectangular in shape. Blade thickness can vary from a half-inch to two inches. Why bother with bamboo if it's so difficult to cut or chip? It regrows quickly, so it's easy to replenish and therefore eco-friendly. 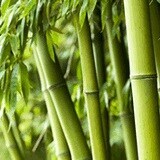 Plus, bamboo chips can be used to make high-energy fuel, and the silica bamboo contains makes it an excellent mulch for soil. Although they're beautiful to look at, palm trees are a real challenge to dispose of. 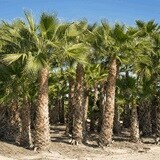 Palm tree fronds and vines are some of the most difficult tree materials to run through a wood chipper. You'll want a large commercial-grade chipper shredder for this kind of a load. The shredding capability will be useful for processing the fronds, and the commercial strength of the chipper blades will enable you to chip wood from the trunk. 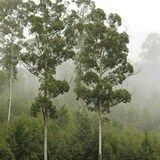 Although varieties of these trees are found worldwide, eucalyptus trees are the predominant tree species in Australia. When you think of the outback, you probably think rough, tough, and wild. Think the same with these armor-clad trees. Eucalyptus wood requires a heavy-duty commercial-grade chipper shredder. Even the leaves and bark pose difficulty. The stringy, fibrous bark and leaves would be too hard on an electric shredder. Using a commercial-grade chipper shredder will allow you to process the leaves and the bark as well as the wood. 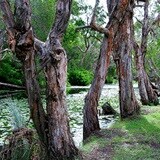 Melaleuca trees are native to Australia. However, they were introduced to Florida, where they proved to be quite invasive and spread all over the state's forests. Chipping a melaleuca tree requires a large commercial-grade chipper, but it can generate supplemental income. Melaleuca wood chips are the most termite resistant of all. They're popular for use in landscaping and can be sold to landscapers and homeowners alike. Which Woods Need More Power? - View Our The Hardest Trees To Chip. Our chipper shredder how-to library can help you pick the perfect electric chipper shredder, gas chipper shredder, pto chipper shredder or chipper shredder vacuum.